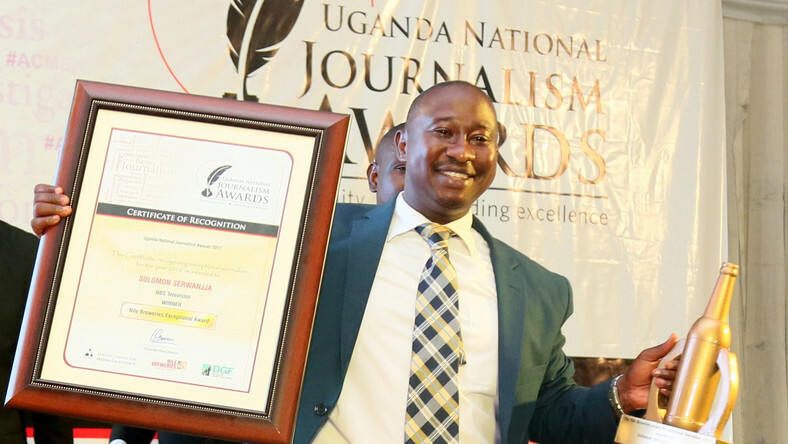 KAMPALA – Solomon Sserwanjja, a new anchor and a senior investigative journalist with NBS television Friday morning handed himself over to police authority in Kampala after several hours on the run. Police on Thursday afternoon declared Sserwanjja a wanted man after operatives from the Internal Security Organisation (ISO) allegedly found classified drugs with the Government of Uganda seal at his residence in Mukono. On Friday morning, police handed a summon letter to lawyer Medard Lubega Sseggona asking his client Sserwanjja to report to Police to record a statement. He arrived at the Central Police Station at 11:50 a.m., accompanied by NBS TV head of news Joyce Bagala and Chief Executive Officer Kin Karisa. At the Station, he was received by the Officer in charge of the Criminal Investigation CPS Joshua Tusingwire who led him to the office of Kampala Metropolitan Police Commander Moses Kafeero. Sserwanjja’s was recording a statement in room 9 CPS Kampala by press time. This comes barely two hours after three journalists from the British Broadcasting Corporation (BBC), a driver and Sserwanja’s wife Vivian Nakaliika, were granted police bond. The journalists who include: Godfrey Badebye, Kaweesa Rashid and Kassim Muhammad, as well as their driver Shadow Kisaame, were detained yesterday at Central Police Station (CPS) Kampala together with Vivian Nakaliika, a Communication Officer with the Ministry of Health. It is alleged that detectives and operatives of the Internal Security Organisation (ISO) had uncovered several boxes of Malaria and Hepatitis B vaccine in Sserwanjja and Vivian’s home in Mukono. Possession of such classified drugs is punishable by a fine of up to 2 million Ugandan shilling and up to five years in prison, according to provisions of the National Drug Policy and Authority Act.